Why on earth do we need to take the game globally? There’s nothing wrong with the game … we have plenty of players (more than we need!) … plenty of franchises to support already (and some of those are difficult to sustain if we’re honest). What’s up with all that? I’m hearing this a lot right now. It’s that time of year where fans up and down the country are jabbing fingers and declaring it a nuisance, an oddity and a waste of time. To that I say, inhale, exhale and read on as the reasons are more profound and necessary than you might think. For example, the game is robust and healthy, no? There are 310 million people in the United States, yet a country of just 81 million out punches them pound-for-pound when it comes to generating money. How so? They can export their product globally. The English Premier League (EPL – soccer) is the template upon which any sport that has yet to achieve a position in the global market place looks at and covets. It’s much easier to sell a product and make a tidy profit when your customer base is a potential 3 billion. So what? There is definitely enough money (just about) to keep the league going as it is – so why should I care about it generating more money?! Well, if I told you that your franchise would be better supported, have a better quality of player on its roster, a better stadium and a higher profile – you should be interested. You’d be crazy not to be, although the only part a real fan would care about is having better players on their roster. We don’t even hit double digits in the NFL. In fact it’s embarrassingly much lower. As a fan, have I suffered for having to watch players like Albert Pujols, Yao Ming and Alexander Ovechkin? Or have my games been the better for having them play in them? Yeah, me too. This isn’t just – although no doubt it’s a primary factor as all business decisions are – just about the money. It’s about the future of the game. has seen it happen all too often before. It used to be a perennial power house and contender in a number of sporting endeavors – rugby, cricket, yachting. All terribly dull and unexciting now, but all the rage earlier in the 20th century I can promise you, but then you see something happened … soccer became professional and starting paying. The more money there was, the less players there were that went into the other sporting disciplines. Very soon the rot was irreversible and forever they were to be underdogs and also-rans. They have brief renaissances, no doubt – but nothing to recapture their former years as the undisputed heavyweight of those sporting disciplines. For example, if the MLS becomes successful to the point that their wages there were to rival those given to football players (bearing in mind that the rookie pay scale in the NFL will be a part of the next Collective Bargaining Agreement) then that kid in high school deciding whether to choose soccer or football we just lost. That’s an extreme example because we are looking in our own backyard, but let’s look further afield. In Japan and China, if you want to be a professional sportsman then you are looking to be a soccer player, a basketball player or a baseball player. No football. In Eastern Europe, Russia and its former satellite states, it’ll be a soccer or hockey player. No football. In fact, on almost every continent you will find soccer and at least one other American sport, but it’s never football. Never. In the EPL and other European leagues, teenagers from all corners of the globe exchange hands for millions and millions of dollars based on their talent levels. Such are the scouting networks that players from the Democratic Republic of Congo are being paid hundreds of thousands a year. The EPL in particular has such an abundance of global talent that next season there will be a minimum of eight “homegrown” (i.e. 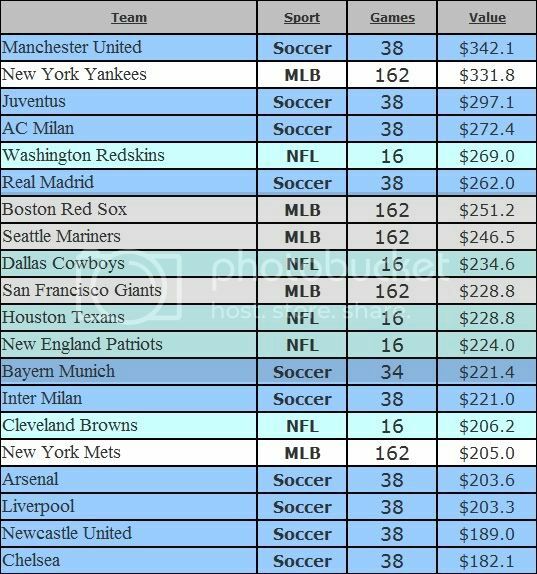 not bought from abroad or another club) players per team (out of the 25-player roster). So, no – the argument that by striving to make the game global we dilute our game and make it weaker and with less quality rings less than true. It’s certainly not been the case with the other three sporting institutions that have explored the foreign markets. Football has an advantage over the other domestic sports in that both the Northern and Southern hemispheres already play a game that has skill sets that can translate in almost every single position (quarterback being the notable exception) with both the Rugby Union & Rugby League. It’s an advantage that will be lost if it isn’t utilized within the next decade. The only other argument I’m hearing about the alleged vandalization of the game is that we are inviting injuries by extending the season. New England Patriots’ owner Bob Kraft responded to that by saying if that were true that he’d expect there to be a correlation with teams, players and injuries in the postseason, but the owners have looked and that it’s not there. You know what? I’ve looked as well and it’s not there. So, in short, I really can’t see what all the fuss is about. I want to see better players on my team, I want my team to be facing better opposition and I want to see more football games. If the league is giving me back any games I might miss as well I really can’t see any downside. I would say one man’s injury is another man’s opportunity. We all saw Miles Austin step in for the injured Roy Williams last season and become a superstar. The NFL is a hungry machine, but a productive one. Unless it moves forward to try and make up for the ground lost to its other domestic sporting rivals then it might be too late all together, and that is an altogether scarier proposition! Talking of scary? In the interests of Halloween I did some digging to see what sort of team could be made for an international franchise using the few foreign players we have and that might be eligible or interested in playing in it. Were you born for the country you wish to represent? Have you spent five years as a resident in that country? Can you trace either of your grandparents back to the country you wish to represent as both native and resident in that same country? Provided you can answer yes to one of those three questions and not played in a competitive match for another country before declaring for another, then you are deemed eligible. Which current NFL player’s grandfather was the prime minister of Uganda until he was assassinated by the dictator Idi Amein? So bear in mind the point of this is not accuracy – only to show that even with hardly any expenditure at all and through providence more than policy delivering these players into the ranks of the NFL that we could achieve so much, much more if we did make it a matter of policy and investment. In terms of which players got selected over others? Yes, there is an element of personal preference, but I always went with the player that was more eligible than one that was a generation or two removed where possible. Sean Payton gets the nod as head coach having been a quarterback in the United Kingdom for the Leicester Tigers with funnily enough a player who went on to lead England to World Cup glory in rugby – Martin Johnson.